Nigeria is a very unique, divers and fascinating country, but cross river state is one of the states in Nigeria that stands out among others. no wonder its called the people’s paradise, cross river is home of nature and culture and that’s why its one of the most popular tourist destination in nigeria. There are tens and hundreds of reason to visit cross river state but here are 8 reason why you should visit cross river this december. 1. To witness Africa’s Biggest Street Party, The Calabar Carnival. Reputed to be Africa’s biggest street party, Calabar carnival is an annual event in cross river state which begin on every 1 December and last till 31 December, the Calabar carnival has boosted the cultural mosaic of Nigeria people while entertaining the millions of spectators within and outside Nigeria. No fewer than 26 countries will be participating in this year’s Calabar carnival. Obudu Mountain Resort in Cross River State boasts of one of the fascinating tourist centres in Nigeria. an ideal place for relaxation and a great place to visit for your vacation. Obudu Mountain Resort is a ranch and resort on the Obudu Plateau in Cross River State, Nigeria. among all the fascinating destinations in Nigeria where one can relax, have fun and commune with nature, Obudu Cattle Ranch Resort has placed cross river state on top as one of the top tourist destinations in Nigeria. Cross river state unarguably has one of the most sought after soup in the nigeria, Afang and Edikag ikong are the most popular soup of the people of cross river. Afang and Edika Ikong soup are one of the most nutritious meal in the country. although it can be found in most big cities in Nigeria but there’s never a better place to eat the soup than in Calabar where it originates from. museum is an institution that cares for (conserves) a collection of artifacts and other objects of artistic, cultural, historical, or scientific importance, Cross river is one of the state in Nigeria with a museum that hosts some of the most preserved artifacts and documents dating back to pre-colonial period. some of these museums are The National Museum, Calabar and The Slave History Museum, Calabar. As a state with deep cultural, social and political history, cross river state has preserved some of the most important structures and sites which has now became a national monument and tourist destinations in the state. These sites includes Mary Slessor’s House, Chief Ekpo Bassey’s House, The Tomb of Mary Slessor and her Statue. Formerly part of the Afi River ForestReserve, the Afi Mountain Wildlife Sanctuary was established in 2000 to provide improved protection to important populations of several endangered species including the critically endangered Cross River gorilla, the Nigeria-Cameroon chimpanzee, the drill and the grey-necked Picathartes or rockfowl. Afi is covered by roughly 100km² of lowland and sub-montane forest with rocky peaks rising to altitudes of 1,300m. Although the steep mountainous slopes of the sanctuary have largely protected it from logging the forest is frequently damaged by dry-season bush fires set to clear new farms or to flush game. Open areas created by fire are quickly colonised by herb species which form an important staple food for gorillas. On the western flank of the mountain is a large grassland roost of migratory European barn swallows, estimated to contain up to 20 million birds at times and reputed to be the largest wintering roost site of swallows in Africa. Cross river is know with beautiful and breathtaking waterfalls, it is no doubt that these waterfalls are one of the destinations that visitors in cross river state will not afford to miss. These fall include the Agbokim waterfalls and the kwa falls. 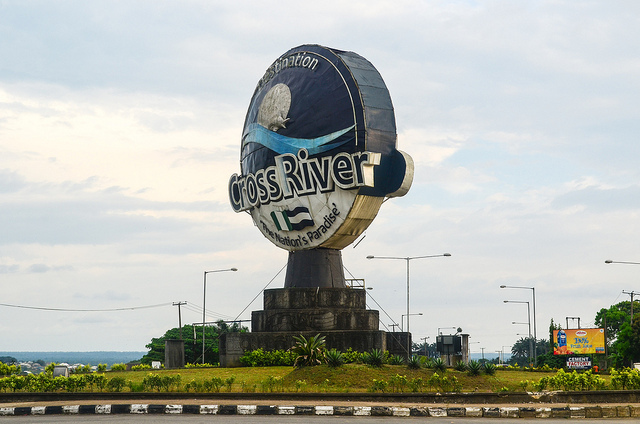 Although Cross river state is a multilingual state with three major ethnic groups and native language which include the Efik, the Ejagham, and the Bekwarra. The people of cross river are very welcoming, accommodating, polite, loving and cheerful, it will be interesting meeting the people, learning their language and experiencing their culture. The carnival sounds SO cool!!! I’m not very adventurous but this looks like so much fun!! Thank you for sharing such a beautiful place! Nigeria is a beautiful country with so much to offer. Beautiful locations to the good food and diverse ethnic groups. I hadn’t heard about this before, but I instantly love dall the pictures and info. That carnival party looks amazing, and so does the food and those landscapes. Adding this to my bucket list!! Wow this is incredible! I’d never heard of this place before, but now I really want to visit! Thanks for sharing. Wow, what a beautiful waterfall! The picture almost makes it seem surreal. Would love a peaceful moment there. Such colorful costumes, mouth watering food and gorgeous waterfalls. Why would one not pay a visit to this place. I am adding this to my bucket list. I’ve heard so many nice things about Carnaval! We actually celebrate carnaval in february here, but not quite like yours! It just looks like a super cool party! 🙂 And the outfits are amazingly put together! Sounds like such a fun trip, worth the visit! Thanks for sharing. What an incredible experience! This looks like a truly cultural experience and I would love to go to Carnival! I’ve never heard of the Calabar carnival but it looks amazing, so colourful, and that’s what I love about Africans, they’re so colorful in their clothing and accessories. It seems this place has the perfect combination of everything – wildlife, nature (waterfalls) and food ! This all looks so amazing! I would love to visit for all of these reasons! ohhhh i wanna go to that Carnival!!! The girls look amazing!!! The AFI sanctuary sounds like a lovely activity too 🙂 The dish pic doesnt look very… attractive, but oh well i guess i can try it once! Thanks for the tips! Well, I never visited Africa but now I will plan to come here. I just love the way you elaborate the Nigerian culture.